Putting on traditional Chinese costumes, outfits that highlight the color red. These children are known as the Little Gods of Happiness. Nine-year-old Ye Lingchen is taking on this divine role for the third time. "We represent the Gods of Happiness, the cute and lovely type of Gods. We bring happiness and gifts to the people around us," he said. Not all children have the opportunity to be a Little God of Happiness. They were chosen from hundreds of applicants in the city, and only the best 20 are given the honor. "This is my first time being a Little God of Happiness. It's a memorable experience for me. 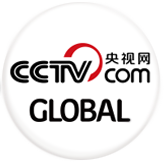 I will make good use of this experience, and take my responsibilities seriously," said Yao Xingran, Little God of Happiness. It's such a joy to come across these little gods of happiness during New Year celebrations. They carry a whole bunch of gifts and hand them out to those celebrating here. It's a symbol of good luck and happiness, while also being a big part of traditional Chinese culture." This tradition originated from the ancient Song Dynasty, about a thousand years back. And it's observed here every year at the Wuhou Shrine in downtown Chengdu. "The heroes we worship here at Wuhou Shrine are known for their loyalty and bravery. People believe they are the Gods of Happiness. And now the little Gods of Happiness are sharing those fine characteristics with visitors here," said He Hongying, Deputy Curator, Wuhou Shrine Museum. While sharing joy with people around them, these children send holiday greetings around the world. And the cultural infusion this brings adds to the festive atmosphere of the occasion. "They are just fantastic, so happy... It’s a pleasure to be around them," said Hugh Higgins, City of Sheffield Pipe Band. "They are beautiful....The gifts are wonderful. Thank you so much," said Theresa Brown, City of Sheffield Pipe Band. 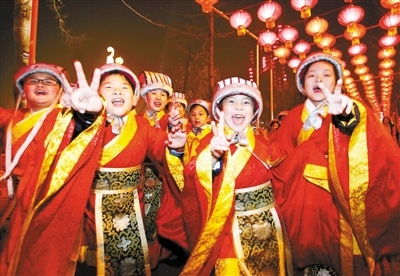 The three-week long event displays both traditional Sichuan folk art and modern performances. And here, it's the Little Gods of Happiness that bring people together, and pass the happiness along.